Mill End Voices is an adult mixed choir that meets on a monthly basis. No membership or previous experience is necessary: just turn up and pay £10 on the door. Newcomers are always welcome at any time of the year and their first session is at the discounted price of £5. We also have a Bring a Tenor, Pay a Fiver special offer, which entitles you to a half-price session if you bring along a new Tenor or Bass singer. The choir is open to everyone aged 18 and above, and there are no auditions! Sessions are informal and fun, if sometimes a little fast-paced, so an ability to read music will help, although it is not a necessity. There are lots of friendly faces/voices to help you out, many of whom have been to a number of rehearsals and know the music well. We often cover a diverse range of genres, from Renaissance to Pop, Broadway Musicals to Rock. Take a look at our Frequently Asked Questions to get a feel for what to expect at a rehearsal, then come along and experience it for yourself! 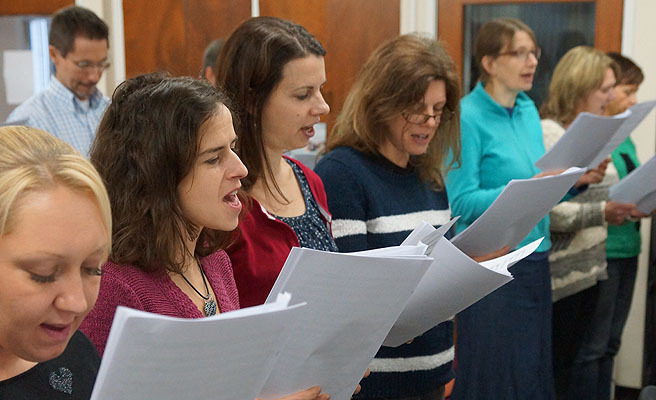 The choir is a not-for-profit organisation which raises money for the High Wycombe Music Centre PTA, to directly benefit the pupils of the Music Centre through the purchase of instruments and music, and to provide support to the activities of the Music Centre. 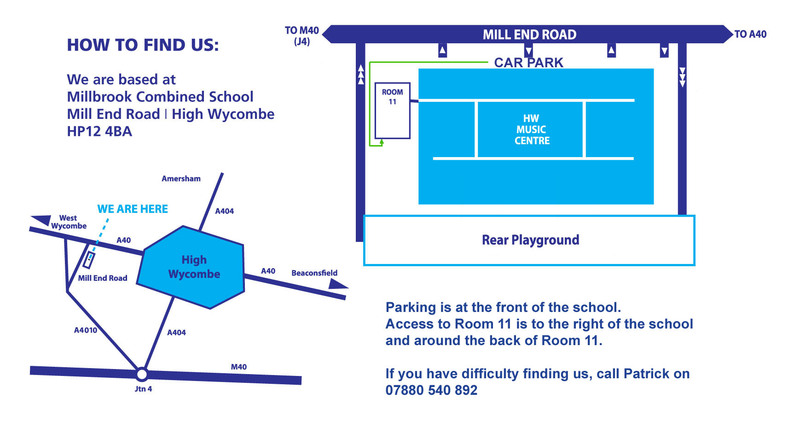 We usually rehearse on the 2nd Sunday of every month at the High Wycombe Music Centre in Room 11 (see parking information or directions to Room 11). There will usually be someone outside to direct newcomers to Room 11. We make an annual appearance in the High Wycombe Music Centre Senior Concert, and also aim to perform at the annual Beaconsfield Festival of Choirs. We end the academic year with a performance in Great Missenden Church. July 2018 saw us take part in the Bucks Music Trust's Celebration Concert at the Royal Albert Hall, and we also organise the occasional recording weekend away at a local conference centre, which includes a choral workshop with top young conductor, Tori Longdon. We also joined Stage Choir on five tracks of their Early Stages CD. Our rehearsal schedule can be found on the Calendar page.